The night before Day 4 of the 2013 US World Championship Trials and US National Championships doesn’t seem to be bringing too many scratches. The biggest shock of the night came from Ryan Lochte, who has scratched all of his scheduled events for Friday. 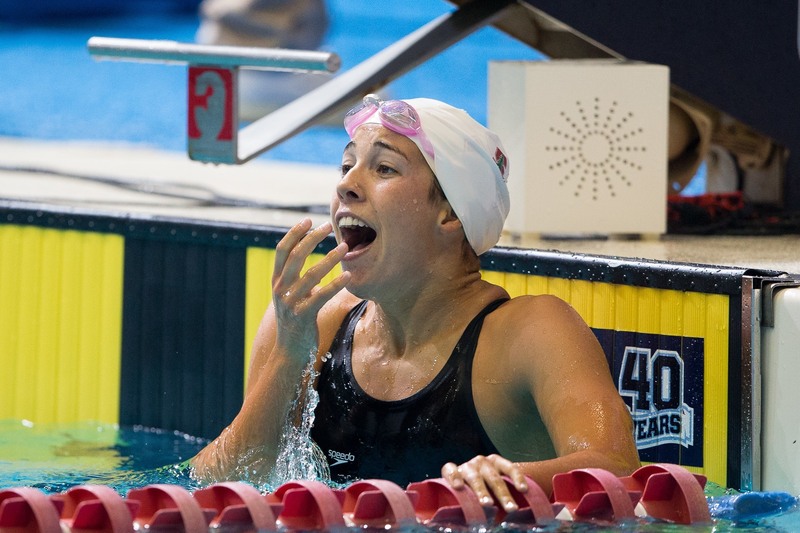 Other than Lochte, the biggest name to scratch was 400 IM first place finisher Maya DiRado. After an exciting night of swims for DiRado, she has decided to scratch her 400 freestyle. DiRado was seeded 14th for the prelim with a 4:12.11, and only has the 200 IM left to swim. Bobby Bollier will be scratching the 400 freestyle on the men’s side, after being seeded 32nd. This would have been Bollier’s last scheduled event. Arden Hills’s Randall Bal will be scratching tomorrow’s 100 backstroke as well. Bal was seeded 9th coming in. Some other scratches include Michaela Merlihan (400 free, 38th seed), William Hamilton (400 free, 19th seed), Samantha Pochowski (100 Breaststroke, 28th seed), Addison Bray (100 breaststroke, 28th seed), Josh Friedel (100 Backstroke, 32nd seed), Connor McDonald (100 Backstroke, 24th seed), Sven Campbell (100 Backstroke, 20th seed). I would like to get in touch with Tim Binning to acquire his Maya DiRado photo for publication. Also, if he has a shot of Eugene Godsoe. We cover Stanford Swimming. Thanks.